Microsporidia are intracellular parasites that are common in invertebrates. Taxonomic classification is mostly restricted to morphologic and physiologic data. Limited data are available about taxonomic classification using DNA-sequence data for analysis. 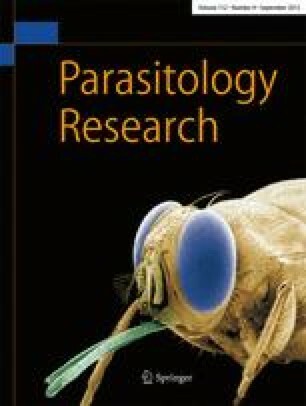 We examined the small-subunit (SSU) rDNA, the intergenic spacer (ITS) region, and a part of the large-subunit (LSU) rDNA of Nosema algerae, a parasite of mosquitoes, taken from a laboratory colony of Anopheles stephensi. Target gene amplifications were done by polymerase chain reaction (PCR) and, after cloning, DNA fragments were sequenced. The SSU-rDNA sequence obtained was aligned with several other microsporidian SSU-rDNA sequences available from the GenBank or EMBL data bases and was analyzed by different methods. On the basis of the results of our phylogenetic analysis, we suggest that our N. algerae isolate is not closely related to other microsporidia belonging to the genus Nosema.